There's no doubt that sausages taste best when grilled over an open flame. When done right, they become crispy on the outside, and juicy and flavorful on the inside. To help you grill your sausages just right, we've provided several tips below, from choosing the right sausages, to getting them juicy and crispy. We wish you successful and delicious grilling! Be careful when choosing "red" sausages for grilling. Red sausages, such as Wiener Würstchen and Frankfurter Würstchen, may contain nitrates and amine, which are used as flavor enhancers and preservatives. When heated to the high grilling temperatures, these two chemicals bind to create the cancer causing Nitrosamine. Ask your butcher or Delicatessen if their sausages contain nitrates. "White" sausages are great for grilling and do not contain any nitrates. 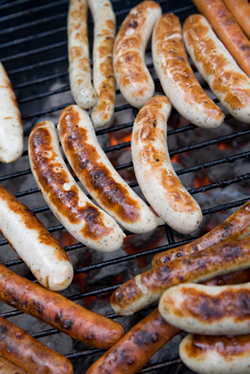 The all-around best wurst for grilling is the Bratwurst, of which there are over 50 different kinds. Other recommended sausages are the Weisswurst and Rostbratwurst. While grilling, do not puncture the skin of the sausage with a fork or knife. 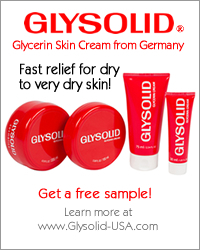 This causes moisture to leak out of the wurst, which in turn causes the wurst to lose flavor and become dry. To get an extra crispy crust, brush the wurst several times with beer while they're on the grill. Also, to keep the casing from splitting open, brush the wurst with oil before placing it on the grill. Some wurst are sold raw, while others are sold pre-cooked. It is important to know this so that they are properly prepared before eating. Be sure to check with your butcher or deli about the Bratwurst they have available. Simply brown these sausages in a pan or on the grill and they are finished and ready to be eaten. Raw wurst is pink in color. Grilling them in their raw form requires skill because they must be fully cooked inside without burning the outside. One recommendation is to cook the wurst in hot (not boiling) water for 5-10 minutes. Once fully cooked inside, brown the outside of the wurst on the grill or in a pan. To grill the wurst in their raw form without pre-cooking, grill them over low heat and frequently spritz them water or beer to cool the skin and prevent burning. When they look done, remove them from the heat and let them rest (covered) for several minutes. The wurst will continue to cook inside which will take care of any part of the sausage that is not yet fully cooked.